The school bus, bringing schoolchildren from town and country. 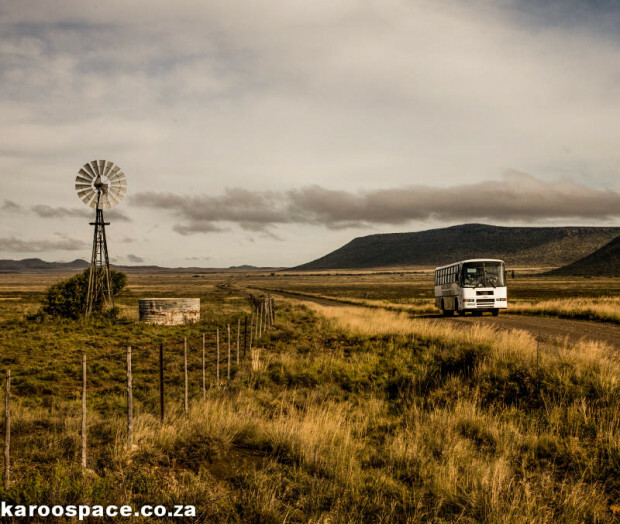 A Climax windmill spins and creaks quietly alongside a dirt road linking Colesberg with the blue horizon. There is a cool morning breeze and a few sheep bleat in the distance. Soon, though, they are drowned out by the distant roar of a straining engine. 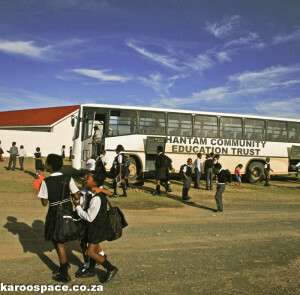 A school bus appears, emblazoned with the words ‘Hantam Community Education Trust’, packed with children wearing grins as wide as the sky. This is no ordinary farm school. The bus heads over the hill and pulls up at a set of neat white buildings, red-roofed and surrounded by trees and lawn. This is the Umthombo Wolwazi Farm School, the Hantam Community Education Trust’s central project, and it is like no other farm school you’ve ever seen. Fast forward to an hour later when the youngsters are in class. 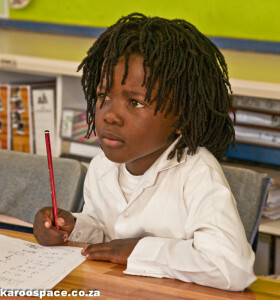 In Grade 2, there’s classical music playing in the background as they concentrate on their books. “Invaluable for calming them down,” says teacher Louise Augustyn. In a classroom for those with learning disabilities, Angelina Allens has the kids (nicknamed the Musketeers) on exercise balls, drawing infinity curves with both hands to help co-ordinate the left and right halves of their brains. The children receive attention from dedicated teachers. In Technology class, Jan Augustyn is explaining how pumps work. Later they’ll head out to a windmill so the kids can appreciate the beautiful simplicity of one in action. In the highly popular school library, Vuyokazi Katise – an old pupil of the school, now the librarian, is cataloguing the 12 000th book to be donated. In the staffroom, Grade 5 teacher Ettorina Stoop, talks of her passion for teaching. It’s a delightful slice of life at an inspirational school, but the light here shines all the brighter when you compare it to what’s happening in other schools. There you’ll find unmotivated teachers, drunk teachers, overwhelmed teachers, children who walk 15 km or more to schools everyday, hungry children, sick children, children with foetal alcohol syndrome, children who are heads of AIDS-orphaned households, schools with no electricity, no toilets, no facilities, no textbooks and sometimes no roofs. Lesley Osler at a Karretjiemense camp, finding out that a pupil is sick. A farm school is the last place you’d expect to buck the poverty cycle. But this school is clearly different. The founders of the Hantam Community Education Trust are Lesley Osler, Clare Barnes-Webb and Anja Pienaar, and when they started this, they had no idea their humble little plans would end up as this little miracle of a school. What these three farmers wives had in mind back in 1989, was a little crèche for their workers’ children, explains Lesley. Its success led to the parents begging for a new school to be created, and against all odds, the three made it happen. 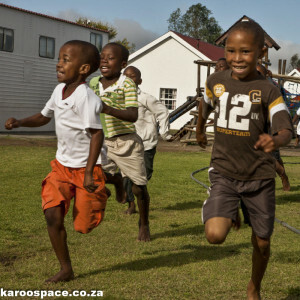 Umthombo Wolwazi (the Fountain of Knowledge) started in 1991 on a vacant house on one of the farms. 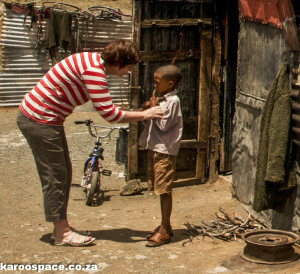 Soon it was serving children in a 50 km radius, most from farms, some from Colesberg, some from the poorest of the poor – the itinerant sheep-shearers, the so-called Karretjiemense. By 1999, some of the teachers were picking up health issues in the children’s development. Someone suggested a community clinic. Lesley, who had become the fundraiser in chief, initially baulked. But as if in response to a prayer, a donor came through. 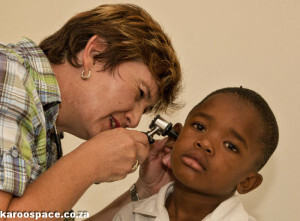 The children are regularly checked for any health issues. Soon they had a fully-fledged clinic managed by a pharmacist and two sisters; three years later, the pharmacy was added. “I thought it was going to be a white elephant. Now I wonder how the community coped before. “We serve a huge area, including Bethulie and Venterstad which don’t have pharmacies. Soon, though, the Trust realised they needed to go even further than that. There were too many children who entered the school with development problems. So with Vuyokazi Katise, Nombulelo Matyeka and Lettie Martins, they started up an Effective Parenting programme of early intervention. As soon as they hear a woman in the district is pregnant, one of their health workers will go to her and explain to her what is happening with her body, what she should and shouldn’t eat, that she risks foetal alcohol syndrome if she drinks alcohol. Community workers counsel mothers on stimulating toddlers. When the baby is born, they teach the mother about hygiene and feeding, about allowing babies to crawl and move freely. As they children grow to toddlers, the health workers take toys with them and toss balls to the children to check coordination, balance and eyesight. They talk to the children and check their hearing. They discreetly check food availability in the house and give advice on everything from growing veggies to creating toys from scrap. 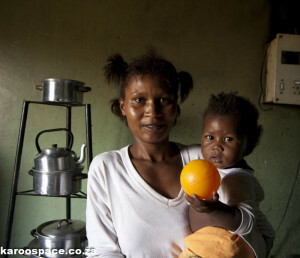 The holistic approach doesn’t stop when the children leave the school after Grade 9. For those that need it and have good marks, there are bursaries that help them matriculate at nearby schools. And if they merit tertiary education, those kinds of bursaries are available too. This is a farm school that offers sports. There are hundreds of little success stories – sons and daughters of barely educated parents who have gone on to become teachers, hairdressers, bank tellers, plumbers, welders and panel beaters. Ninety percent of their past pupils are gainfully employed. The Trust also runs a ‘hospitality school’ in Colesberg that helps youngsters learn basic cooking, front of house skills and housekeeping. “We’re helping them to break the poverty cycle,” say the founders. For more information, call 051 753 1419 or email les.hantam@mweb.co.za. 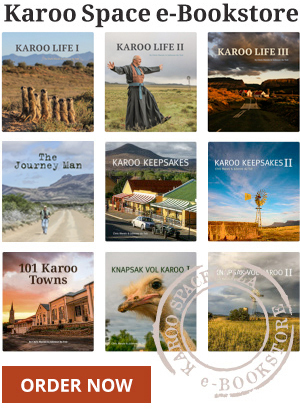 The school also features in Karoo Keepsakes II – The Journeys Continue. The recently-published book is the perfect gift for someone with any link to the Karoo. Click here for the Karoo Space e-Bookstore. Trustees Clare Barnes-Webb, Lesley Osler and Anja Pienaar and at back, project manager Estelle Jacobs.